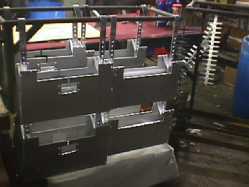 Hard Coat Kit: Type III anodizing for extreme wear application. Includes Alkleen, Desmut AL aluminum purifier, Hard Anodizing (hardest anodized aluminum finish) Anodizing Additive for fume suppression and operational temperature broadening, Kool Sealer, Anodizing Stripper, 1000 Series Aluminum Anodizing Cathodes, 7 tanks, sample of assorted titanium racking wire, masking kit (two masking paint & anodizing tape), Black dye, tank heaters, and more. You do not need to supply any chemical except for water. Tank sizes are LxWxD in inches. 2.3 gallon kit $719 Tank size - 9"x 7.5"x 9.5"
5 gallon kit $980 "C"= $1390 11"x 8.75" x 14.5"
6 gallon kit $1090 "C"= $1550 12"x 11" x13.5"
10 gallon kit $1490 Tank - 15" x 12" x12.5"
15 gallon kit $1850 Tank - 15" x 12.5" x18.75"
SEMI COMMERCIAL ANODIZING SYSTEMS: Includes seven in-house fabricated plating tanks with contact saddles & bus tabs, solid cathode bars for anodizing tank, portable bus bars, chemical heaters, Chemicals (Alkleen, Desmut AL, Hard Anodizer, Anodizing Additive for fume suppression and operational temperature broadening, Kool Sealer, Ano-Strip), Black, Anodizing Illustrated book, misc titanium racking rods, professional anodizing cathodes, and more. 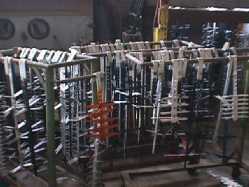 There are 15-22 options for the hard anodizing system. Rectifier and HVLP agitation system (not included) needs can be assessed at time of quoting systems. MIL spec and AMS spec are best served by commercial system which is priced to the right. Size of anodize tank in LxWxD inside. 2.3 gallon kit $409 Tank size - 9"x 7.5"x 9.5"
5 gallon kit $539 Tank - 11"x 8.75" x 14.5"
6 gallon kit $609 Tank - 12"x 11" x13.5"
Above are some of our available colors that were anodized with the very same chemical steps in our 'Show Anodizing Kit' and our Bright Dip. All samples are done on 4000 series aluminum cable brackets that we had bought at a local hardware store with a matte finish. No buffing or polishing was done on these parts. Results on 6000 series will be as good or better than this. Compare this finish to any other illustrated on the internet or catalog and you will see there is no comparison.